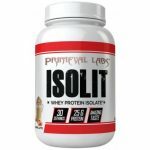 That’s 200 servings of 100% whey isolate for $64 shipped! Available in unflavored for this price, other flavors available for a few dollars more. Add any two Impact Whey 5.5LB bags – any Flavor to your cart. Use MyProtein coupon ‘ ISO11‘ during checkout.